MOSCOW, May 25. /TASS/. The Project 11711 large amphibious assault ship Pyotr Morgunov has been floated out at the Yantar Shipyard in Kaliningrad, Russia’s Defense Ministry reported on Friday. "The Project 11711 large amphibious assault ship is the newest development of Project 1171, under which the Yantar Shipyard built a series of 14 warships in the 1960s-1970s. The entire accumulated experience was used to build the large amphibious assault ship," Head of the Russian Navy’s Shipbuilding Department Captain 1st Rank Mikhail Krasnopeyev said at the warship’s launch ceremony. 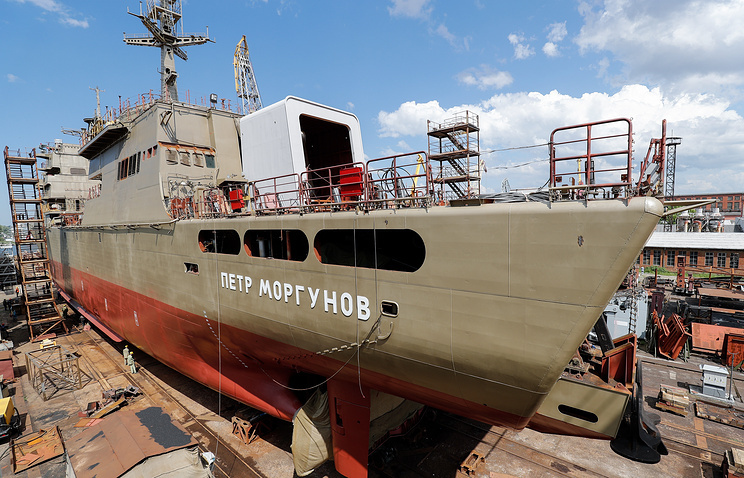 The Pyotr Morgunov is the first serial-produced Project 11711 warship designed by the Nevskoye Design Bureau. The contract on the warship’s construction was concluded with Russia’s Defense Ministry in September 2014 and the warship was laid down in June 2015. The Pyotr Morgunov is the largest in its class and displaces 5,000 tonnes. The warship is expected to be accepted for service in the Russian Navy after all of its trials are over. 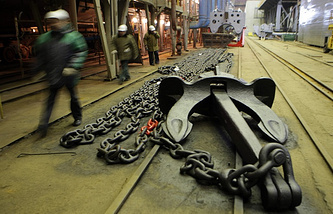 "Pursuant to the technical requirements, which the Navy’s main command set to the shipyard, the large amphibious assault ship Pyotr Morgunov has modern crane equipment installed on it to load military hardware on the warship. Apart from this, the hardware can be loaded onto the warship through the ramp," Krasnopeyev said. The Pyotr Morgunov will be able to take on its board 13 tanks or more than 30 armored personnel carriers and infantry fighting vehicles. An option is envisaged for taking a marine infantry battalion on its board. The Pyotr Morgunov has an operating range of about 4,000 miles, which will allow it to perform missions in distant waters. The large amphibious assault ship can temporarily house various types of shipborne helicopters.